RESISTANCE, Ultra Worldwide’s esteemed underground concept, has come a long way since its Ultra debut as a single stage in 2015. With Ultra Music Festival 2019 around the corner, RESISTANCE has announced that it will be returning to Miami this year with its most ambitious plans yet. Following the news that Ultra Music Festival officially moved to its new venue at Historic Virginia Key Beach Park & Miami Marine Stadium, RESISTANCE has revealed that it will have its own island, taking over the Historic Virginia Key Beach Park side of the venue for the weekend. This comes as a significant upgrade as the concept will have more space and hours to use than ever before. The festival will officially run from 2pm – 2am on all three days. With the RESISTANCE island takeover official, the organizers have announced that for the first time ever, it will be hosting the Carl Cox MegaStructure for the entire weekend. The King himself is set to headline all three days, with an additional exclusive B2B set on Saturday with a special guest. While Carl will be leading the charge at the MegaStructure all weekend, Richie Hawtin’s PlayDifferently will run a takeover at a brand new RESISTANCE structure on Saturday. This however, is not the only plans RESISTANCE has for its island. In addition, RESISTANCE plans to utilize its expansive space by bringing in a third stage, aptly named The Arrival. For those unfamiliar with The Arrival, it is the stage that comes straight from the PLAYGROUND Sound Camp at Burning Man. Armed with three stages and newly extended hours, RESISTANCE did not hold back on its program, dropping its most comprehensive lineup to date. In addition to RESISTANCE Global Ambassador, Carl Cox, and Richie Hawtin, headliners include the likes of the Adam Beyer, and Sasha | John Digweed, acts that are jumping from one island to another after enjoying a stellar season as RESISTANCE Ibiza residents last summer. In addition to Adam playing his own set, the Don of Drumcode will be teaming up for a highly anticipated B2B set with Cirez D.
Headliners making their RESISTANCE Miami debut include Deadmau5’s techno alias, Testpilot, Belgium’s Charlotte de Witte and Italy’s Ilario Alicante. Meanwhile, techno pioneer and Cocoon boss Sven Väth returns to Ultra Music Festival for the first time since 2013. Moreover, RESISTANCE Miami will see the return of the rare B3B set between Dubfire, Nicole Moudaber and Paco Osuna, as well as an exclusive B2B set between Jamie Jones and Joseph Capriati. The rest of the headliners include Art Department, Black Coffee, Hot Since 82, Joris Voorn, Loco Dice, Maceo Plex, The Martinez Brothers, Matador, Nic Fanciulli, and Tale Of Us. While the headliners are great, RESISTANCE did not hold restraint on any of their support bookings either. 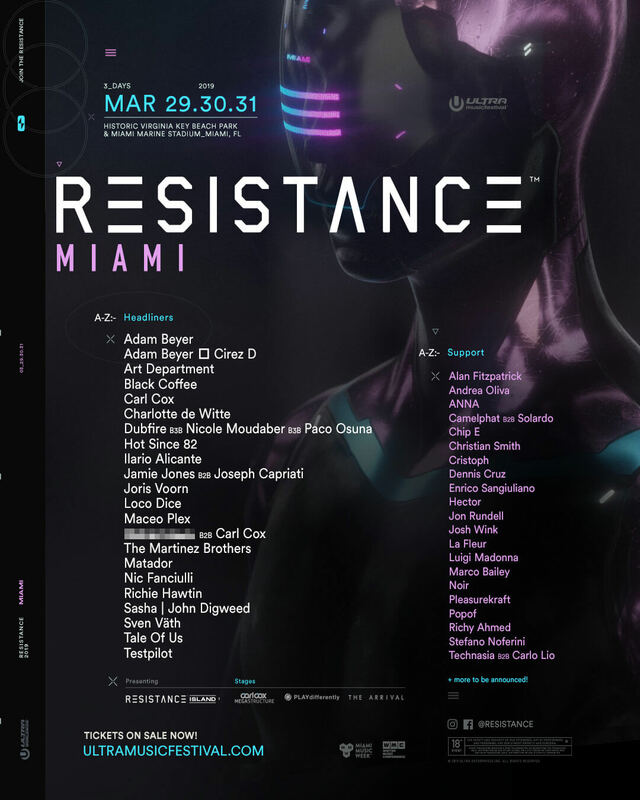 Alan Fitzpatrick, Andrea Oliva, Dennis Cruz, Enrico Sangiuliano, La Fleur, Noir, Richy Ahmed, Camelphat and Solardo will all be making their RESISTANCE Miami debut, with the last two set to go B2B. Additional support acts include ANNA, Chip E, Christian Smith, Cristoph, Hector, Jon Rundell, Josh Wink, Luigi Madonna, Marco Bailey, Pleasurekraft, Popof, Stefano Noferini, and Technasia B2B Carlo Lio. Now releasing its best lineup to date, RESISTANCE continues to grow its presence in the US as it has around the world. With upcoming appearances in South Africa, a debut in Australia, and a third season in Ibiza, where it is set to dominate Tuesdays at Privilege from July 23 – Sept 17 once again, RESISTANCE shows no signs of slowing down. RESISTANCE MIAMI will take place at Ultra Music Festival at Historic Virginia Key Beach Park & Miami Marine Stadium on March 29, 30 and 31, 2019. General admission tickets can be purchased at ultramusicfestival.com/tickets.